It has been a while since I have posted a full outfit post. I have been busy doing a big lategram of my travels and on top of that sorting out my flat moving. Last weekend, spent flat hunting and discovering new London areas in these cute red striped dress with a fish pattern from The Joy. How gorgoeus are they! 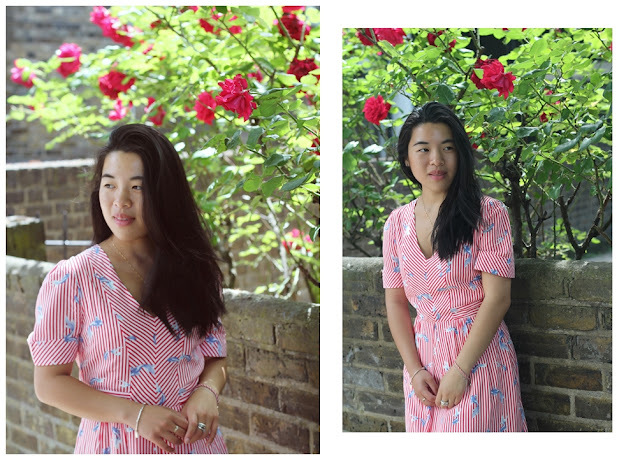 The Joy shop is located just few minutes away from me on Brick Lane and they offer so many variety of women's dresses, in different summer styles for any occasion! Loving it. Besides wondering around the Londons' neighborhood in a cute dress, I have finally found a new flat to move in, so will have another busy week and half or so. Don't forget to catch my daily stories on insta! Click on here to shop my exact dress or shop the similar outfit products below.